When I visited my parents the other day, they were making this nabak kimchi (나박김치). It’s definitely one of their favorite kimchi dishes! 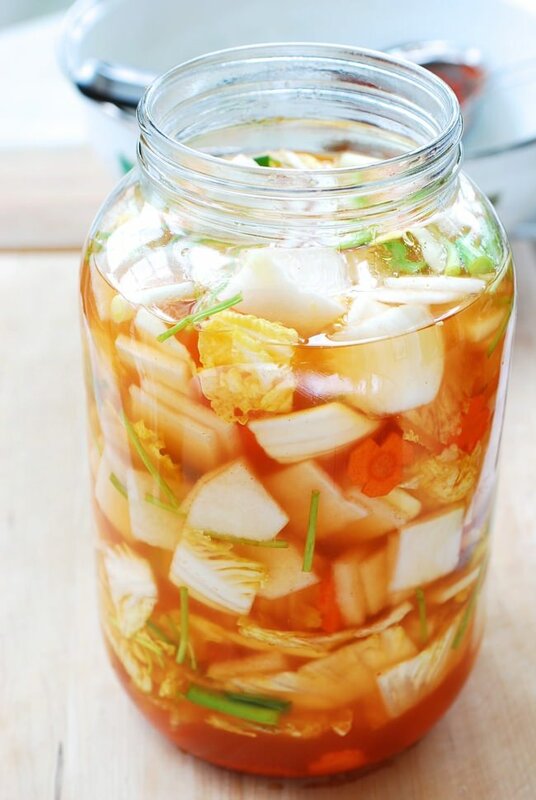 Nabak kimchi is a type of water kimchi that’s made with thinly sliced radish squares and other vegetables. It is easy to make, yet deliciously refreshing! The name of the kimchi stems from the way the radish is cut for this kimchi. 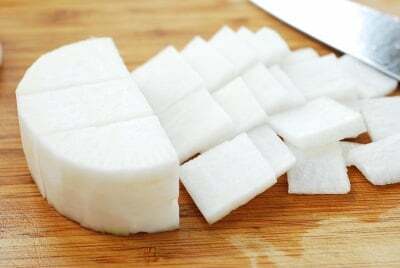 Cutting into small, thin squares is called nabak sseolgi (나박썰기). Sseolgi refers to a cutting technique. 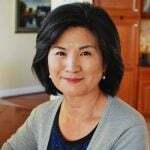 Watching them make it, I realized I had not made this kimchi for a while, so I decided to make it for the blog! 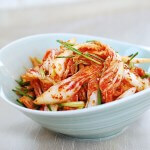 Nabak kimchi is commonly enjoyed in the springtime when the kimchi made in the fall gets old. It’s also a traditional holiday kimchi. 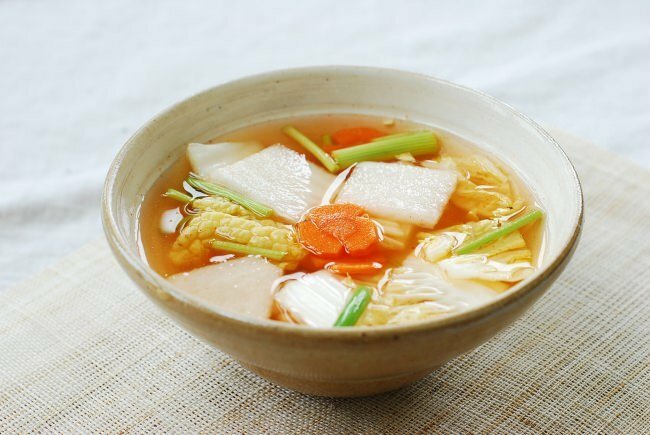 Growing up, we always had nabak kimchi with tteokguk (rice cake soup), which is a New Year soup. They are delicious together! It’s a mild, clean tasting kimchi, so nabak kimchi doesn’t call for fish sauce or salted shrimp. 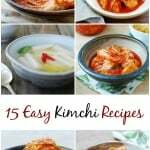 If you’ve been looking for a vegan kimchi, here’s one for you! 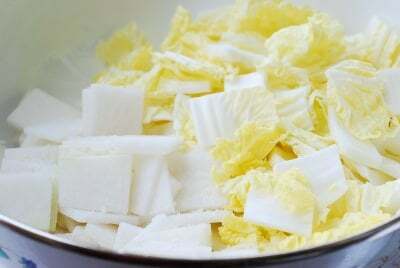 Radish and cabbage squares are lightly salted and then mixed with all other ingredients. 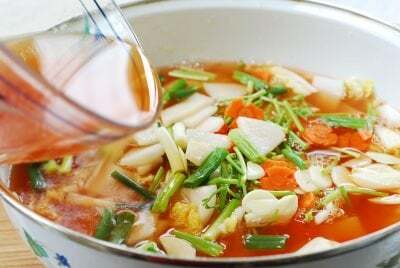 The water is seasoned with salt, and colored lightly with gochugaru (Korean red chili pepper flakes) through a strainer or cheesecloth to keep the kimchi broth nice and clean. The garlic and ginger are thinly sliced, rather than minced, again to keep the broth clear. The addition of Korean pear is traditional, but an apple is also commonly used. 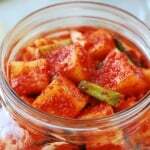 The fruit gives the kimchi a slight fruity sweetness. Minari (water dropwort), which is a crisp herb with a distinct taste, is also traditional and adds a delicately pleasant flavor to the kimchi. 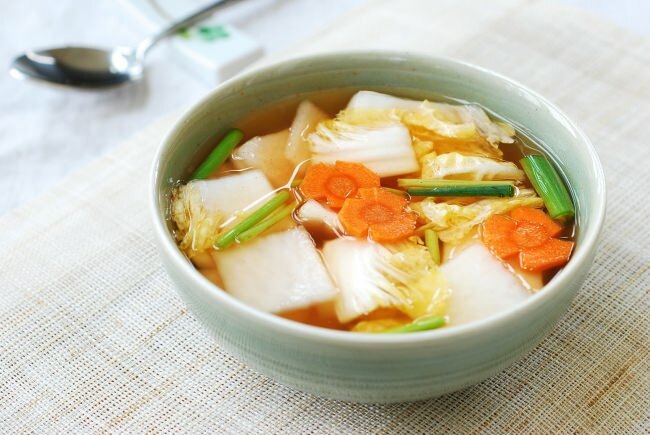 Nabak kimchi is a type of water kimchi that’s made with thinly sliced radish squares and other vegetables. It is easy to make, yet deliciously refreshing! Clean the radish by scrubbing with a brush and/or scratching off the stubborn impurities with a small knife. Do not peel the skin. Cut into about 1-inch thick discs. Cut each disc into 3 pieces, and then slice thinly into about 1-inch squares, placing in a large bowl. Cut each leaf of the cabbage lengthwise into 1-inch wide pieces, and then crosswise into about 1-inch pieces. Add to the bowl with the radish. Sprinkle with 1 tablespoon of salt, and toss well to evenly distribute the salt. Let it sit until wilted, about 30 minutes. Do not rinse. In a small bowl, soak the gochugaru in 1/2 cup of water. To cut the carrot into flower shapes, cut 3 to 4 ”‘V” shape grooves lengthwise, and then cut into thin slices. Or simply slice crosswise into thin rounds. Cut the pear into about 1-inch squares. 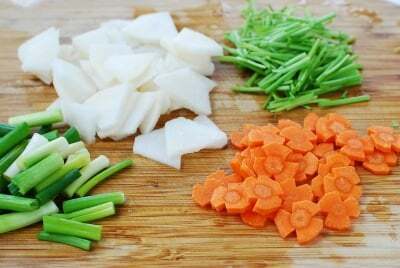 Cut other vegetables into about 1-inch lengths. Add to the bowl with the salted radish and cabbage. 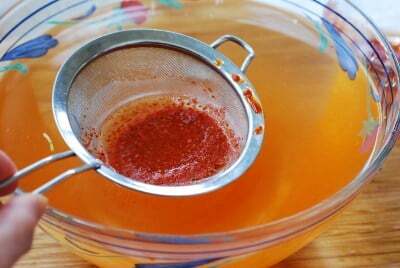 In a large bowl, dissolve 2 tablespoons of salt in 10 cups of water. Strain the soaked gochugaru into the water through a fine mesh. Pour the broth over the radish mix and stir well to combine everything. Adjust the seasoning to taste if necessary. It will actually be easier to handle if you place the radish mixture in the container or jar first, and then add the broth. Keep it in an airtight container or jar. Leave it out at room temperature for a couple of days before storing in the fridge. 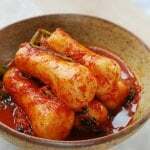 The kimchi can be eaten within a few days. Stir to the bottom each time before taking some out to serve. Do you leave this out on the counter? and for how long? Yes, leave it out at room temperature for a couple of days. I will add that to the recipe. Do you use coarse Korean sea salt or just table salt? You’re using the salt only to season and not going to wash the cabbage and radish afterwards. So use regular salt you use to season your food. Enjoy! I love this in the summer – cold and refreshing! Love the crunch of the veggies and, of course, slurping up the broth. ^^ TY for the recipe! Can I leave out the carrots because of food allergies? Definitely! The carrot is more for color so it won’t make a big difference. Enjoy! Can I use daikon instead of the mu? a slight difference in taste and texture, but you can use it. Enjoy! amazing . love it alot. How long can this be kept in the refrigerator? 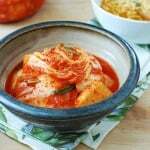 Can I cook the cabbage in this type of kimchi like I would with regular kimchi (stewed with pork or kimchi fried rice)? It will keep well for a few weeks. 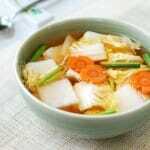 Water kimchi is not good for cooking. 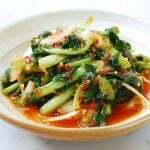 That doesn’t mean you can’t use it in a stew or fried rice, but the result will be quite different from using the regular kimchi. 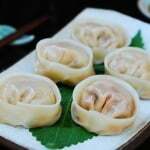 this is one of my favourite foods when I go to Korea and I want to make it at my home in England but I think the radishes will be diificult to find – I live in a very small village in a very quiet county! But looking at your recipe I can remember the delicious refreshing taste. Since this is refrigerated could it be warmed or is it best as a cold dish? Yes it’s best as a cold dish.